This is a book on a par with Badham’s Prose Halieutics, published twenty years earlier and it makes a much better read, Manley having a considerably more relaxed style than his predecessor. The only fly in the ointment is that Fish and Fishing is scarcer than Halieutics, partly because it was published with cardboard covers and most copies simply fell to pieces. But if you see one in approaching decent condition, snap it up, because it is still a good read a century later. 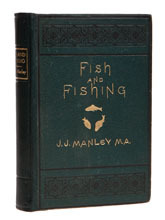 Manley was a Thames fisherman and the chapters deal with every kind of fish found in the river, apart from the eel and the lamprey (he ran out of space). This isn’t a manual, more an appreciation of the qualities of each fish along with tales of days spent catching them and a wonderful chapter on punt fishing. Fish and Fishing is good enough to deserve the minor classic status that has somehow eluded it up till now.